Star Wars Sushi by Japanese sushi chef, oki. George Lucas is well known for capitalizing on the merchandising of his movie franchise, Star Wars. 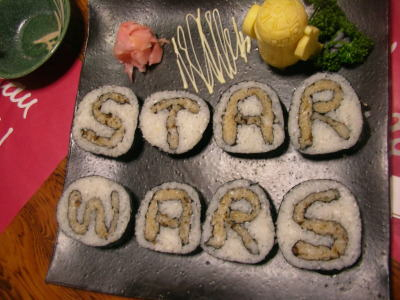 For those that think that he left no stone unturned in milking it for all it is worth, behold: Star Wars sushi! Not an officially-licensed product (yet), the creations by oki, a Japanese sushi chef blogging over at blogspot, are well done. Be sure to click the link above and check out his “Darth Vader Roll” as well as his “Carrot Darth Vader” from the source link below. The darkside never looked so delicious.